More than 170 countries pledged as part of the 2015 United Nations climate treaty to keep global temperature rise this century to lower than 2 degrees C above pre-industrial levels and to strive to remain below 1.5C. When the UN followed the Paris meetings by asking the Intergovernmental Panel on Climate Change (IPCC) to evaluate the goals set out by the agreement, the same experts worried that scientists risked their credibility if they were to paint an overly rosy picture of what it would take to achieve the agreed upon targets. Yet the IPCC report released this week is the exact opposite of sugar coating, revealing instead that the temperature targets established by the 2015 UN Paris treaty are tragically more aspirational than realistic. For countries to achieve the 1.5C goal, concludes IPCC scientists, global carbon dioxide (CO2) emissions would need to be cut 50% by 2030 and entirely by 2050. In 2017, CO2 emissions worldwide rose by nearly 2 percent and are on track to rise again this year. At this rate, estimate IPCC scientists, the world will pass the 1.5C threshold sometime around 2040, risking trillions of dollars more in damages and millions more lives lost from climate change impacts. News coverage of the IPCC report has been nothing less than dystopian, warning of a runaway monster. “We have 12 years to limit catastrophe, UN warns,” was the headline at The Guardian. “The world has just over a decade to get climate change under control, U.N. scientists say,” echoed the Washington Post. These apocalyptic headlines come as new Yale/GMU polling shows that although a strong majority of Americans are increasingly worried about climate change, they are also expressing diminishing hope that something can be done. For those of us who study climate change politics and communication, and for advocates and philanthropists who have relied on our advice to inform strategy, the latest IPCC report is reason for deep introspection about the current state of research and the need for bold, new thinking. For too long, as scholars, we have focused narrowly on general public attitudes, evaluating by way of opinion polls or experiments strategies to more effectively communicate climate change risks. But in doing so, we have never adequately articulated the conditions by which public mobilization might translate into effective public policy action. Nor have we examined closely the process by which political elites, those in the best position to make decisions about our collective future, might come to agree on the same effective policy approaches but for different reasons. As scholars, our unhealthy obsession with the psychology and communication strategies of “deniers” has also reinforced a bunker mentality among climate advocates that is highly resistant to legitimate criticism or alternative ideas. The result is a discourse culture that substantially reduces opportunities for developing effective policy and technology approaches on climate change that broker support among not only liberals, but also moderates and conservatives. 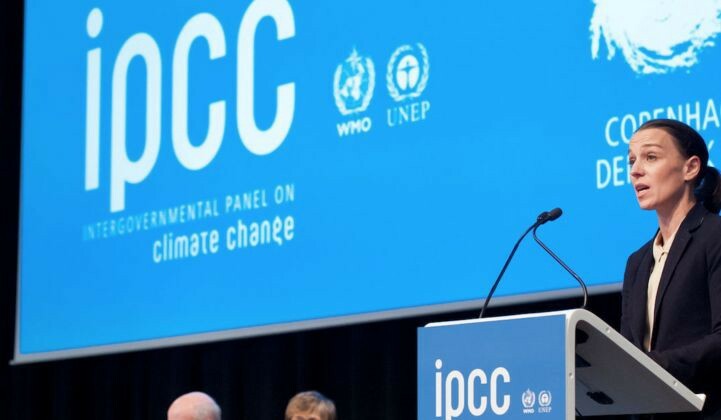 In the face of the daunting challenges identified by IPCC scientists, the likely response from many researchers, environmentalists, and philanthropists will be to double down on a widely shared mobilization doctrine. As this doctrine stipulates, achieving major Federal legislation such as a carbon tax depends on solving the puzzle of public persuasion: How can climate change be framed in a way that resonates with the identities, priorities, and interests of voters, motivating them to elect candidates dedicated to aggressive climate policy action and to holding the fossil fuel industry accountable? This theory of change assumes that if the right messages and trusted opinion leaders are deployed, climate change in the minds of voters will eventually pass a certain threshold of perceived urgency and importance, thereby creating the conditions necessary for passing major legislation. Acting on these assumptions, in 2008 former Vice President Al Gore announced that he would be launching a three-year program of persuasion to rival that of the oil campaigns. Over the next two years, the Climate Reality Project spent $115 million on TV advertising, social media strategies, and related operations to boost public concern and support for policy action. In the years since, a range of other well-financed communication efforts have been launched. In one example, for the Showtime series Years of Living Dangerously, the producers raised $20 million to support development, filming, marketing, and digital outreach. The goal of the series, according to its science adviser, was to persuade the 40 percent of Americans who at the time were estimated to be on the fence about the issue. 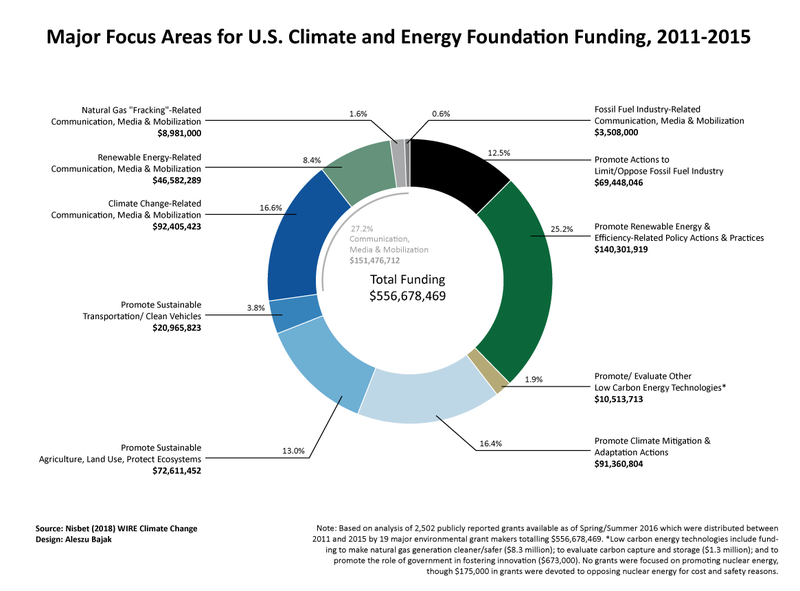 Between 2011 and 2015, the country’s major climate change foundations spent $150 million, or nearly 30% of all grant dollars distributed, supporting communication activities intended to intensify concern about climate change, drive support for renewable energy, and turn national sentiment against the fossil fuel industry. Philanthropic investments in public mobilization have been complemented by hundreds of millions more raised by environmental groups from major donors, online contributions, direct mail, canvassing, and membership appeals. At the front of the pack has been the California billionaire Tom Steyer who since 2014 has spent more than $200 million on efforts to elect Democrats committed to aggressive climate change action. Over the past two decades, operating within a similar paradigm of thinking, scholars have published hundreds of studies evaluating public attitudes in the United States about climate change and the message strategies that might shift them. In parallel to these studies, thousands of public opinion surveys have been conducted. 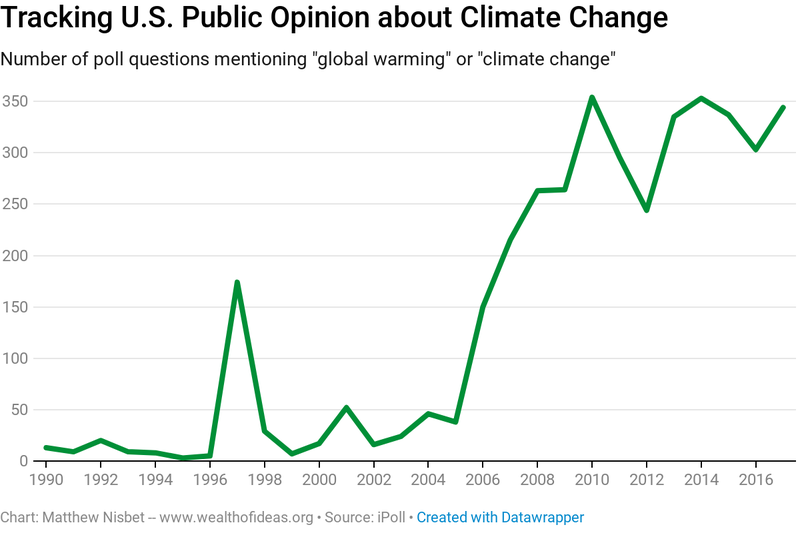 By 2010, pollsters on average were asking a question about climate change every day, making it among the most heavily polled topics in history. I was once a leading proponent of the mobilization doctrine. As President Obama took office in 2009, I argued in an oft-cited article, that it would take a major shift in the polls and a surge of input from a diversity of constituents for Congress to pass cap-and-trade legislation. Yet as I studied the eventual demise of cap-and-trade legislation, and the mobilization efforts by environmental groups and philanthropists in the years since, I came to realize that as scholars we have failed to adequately specify the conditions under which public opinion about climate change might translate into Federal policy action. Recent history suggests that public opinion is at best only weakly related to legislative action. Research in political science similarly paints a complicated portrait of the conditions under which legislators are responsive to public opinion. During the Obama years, when health care reform passed, less than a majority of Americans supported it. Even four years after the Tobacco Regulation bill passed in 2009, less than a majority of Americans favored its key provisions. When the Trump GOP tax plan passed this year, just 40% of Americans said they approved of the bill. Specific to climate change, for the past few years, Yale/GMU polling has consistently shown that majorities of registered voters, including Independents and moderate Republicans, believe that global warming is mostly caused by human activities and say that they support climate regulations and clean energy policies. 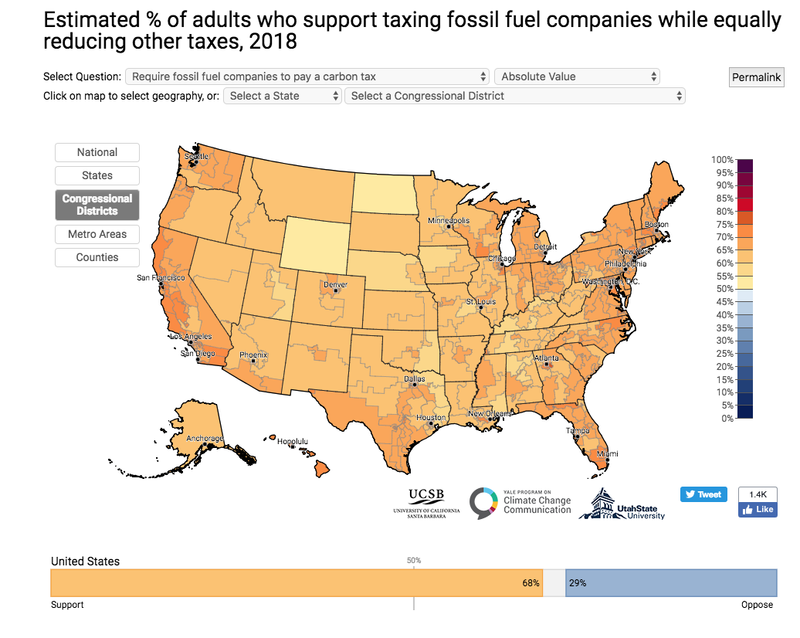 Beyond this general voter sentiment, according to the Yale Climate Opinion Maps project, a majority of adults in every Congressional district across the country say they support fossil fuel companies paying a carbon tax, regulating CO2 as a pollutant, and setting strict restrictions on emissions from coal power plants. The take-away is that public support for climate change policy is neither a sufficient nor necessary condition for Federal legislative success. An obvious counter-argument is that a doubling down on the mobilization doctrine is still needed, since even though voters voice support for climate change policies, they have yet to view climate change as a top voting priority. As of March 2018, for example, fewer than four in ten registered voters (38%) in a Yale/GMU poll said that global warming would be “very important” to their vote in this year’s Congressional elections and only 2% of registered voters said it would be the most important issue. Among those voters who viewed global warming as a leading priority, the great majority identified as liberal Democrats, a group that comprise 25% of registered voters but who reside disproportionately in large cities on the East and West Coast. But even among Democrats identifying as “very liberal,” when asked in a different poll what issues they hoped a Democratic President and Congress would focus on if elected in 2020, climate change ranked behind health care, guns, immigration, and deficit reduction. And that poll was taken before the Bret Kavanaugh Supreme Court hearings, with impeachment of Kavanaugh recently added to the list of Democratic priorities by House caucus leaders. But assuming environmentalists and their allies were able to run perfectly executed election campaigns on behalf of “climate hawk” Democrats and achieve victory in 2020, they still face major structural barriers to Democrats holding on to both chambers of Congress and the White House. Consider that since 1968, Democrats have controlled the Executive and Legislative branches for a total of eight years out of fifty. Absent major electoral reforms, the pattern of continual divided government will remain in place for years to come. For these reasons and others, for any policy proposal to have a chance of winning enough support from Republicans (and moderate Democrats) to pass in Congress and to be politically durable, a different theory of policy change than the mobilization doctrine is needed. One possibility is to shift from the longstanding framing of policy action in terms of avoiding catastrophe, ramping up carbon taxes to between $135 and $5,500 per ton by 2030, what the IPCC estimates is needed to achieve zero emissions by mid-century. Instead the discussion with policymakers should emphasize the variety of benefits to be gained by achieving a 100% zero carbon economy fueled by cheap, abundant energy innovations. If you haven’t noticed, it is the exact same end goal, just presented differently. As science policy scholars Dan Sarewitz and Roger Pielke Jr have long argued, once a range of technologies are available that make moving off of fossil fuels cheaper, much of the political motivation to focus on scientific uncertainty as a means to forestall action is likely to subside. The great promise, for example, of a technology like carbon capture and storage, that if perfected could trap emissions from natural gas plants and bury them underground, is how it could fundamentally alter the political debate. In a similar line of reasoning, as Jesse Jenkins of Harvard University told The New York Times, the most likely path towards a national carbon tax may be an indirect one. It begins, argues Jenkins, with passing less noticeable and more incremental government actions that directly drive energy innovation aimed to create cheaper alternatives to fossil fuels, thereby making consideration of future carbon taxes more politically palatable. Successful examples since the 2016 election which have gained little notice include tax credits for renewables and carbon capture and storage as part of the 2018 Federal budget bill; and a bi-partisan sponsored bill, passed by Congress and signed into law by President Trump that creates the regulatory framework enabling advanced nuclear energy to move forward to market. So what role can communication researchers play in this process? By focusing so intensively on public opinion, we have yet to even evaluate the relevant factors that influence elite-level decisions on these valuable yet below the radar bills where bi-partisan cooperation has been proven to be possible. A place to start is to do the hard qualitative work of spending time talking to and listening to dozens of Congressional staffers from both parties, noting the assumptions and priorities that they and their bosses bring to energy innovation policies, the sources of information they rely on, who they judge trustworthy or authoritative on the topics, how they communicate their positions, and the conditions under which agreement might be reached. This research has in turn infected mainstream journalism and commentary, in which readers at outlets like The Guardian and The Washington Post are consistently left with the impression that “anti-science,” “denier” Republicans may in fact be cognitively incapable of reason or compromise on behalf of clean energy policy, similar in nature to Holocaust deniers. In a 2008 interview with PRI The World, I suggested that the term “denier” was counter-productive. Resorting to extreme language and name calling in the climate debate not only inflames tensions among opponents, I argued, but for decision-makers on the center-right struggling to come to terms with climate change as a societal priority, resorting to “denier” rhetoric misses the opportunity to more persuasively connect the issue to commonly shared values, or to fashion compromise around policy approaches. That year geographers Max Boykoff and Saffron O’Neil in a letter to the Proceedings of the National Academies of Sciences (PNAS) raised concern about an earlier study at the journal which had divided experts into “convinced” and “unconvinced” camps, interchangeably using the terms “deniers,” “skeptic,” and “contrarians” to refer to the unconvinced. Their warnings, however, had little impact on the direction of scholarship, strategy, or journalistic coverage. The PNAS study they questioned would also eventually serve as part of the basis for today’s “97% consensus” messaging campaign on climate change. The early research in this area has generated several promising findings, but the strategy has also been challenged by other scholars who find that such messaging may not be able to overcome partisan filters or counter-messages, and by those who warn it distorts policy debate. 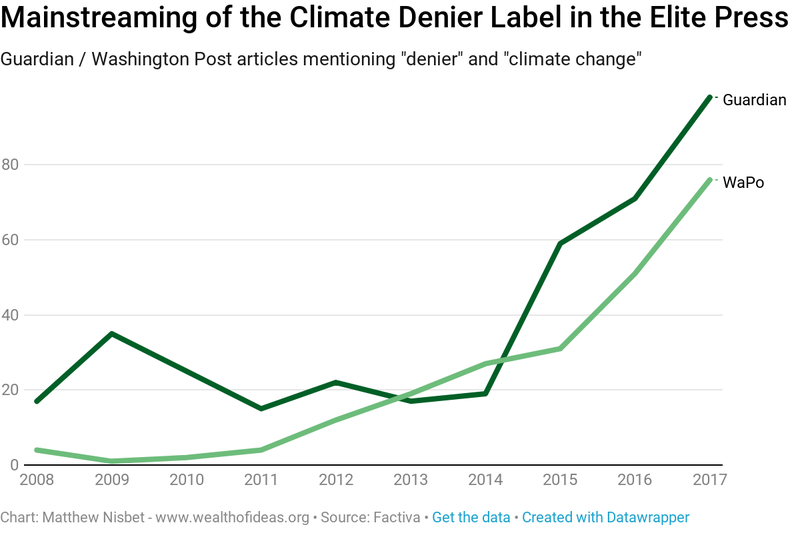 The wisdom of consensus messaging aside, the ubiquitous branding of Republicans as the party of “denial” by scholars, advocates, and journalists has also greatly exaggerated the intensity of opposition to climate solutions among those on the center-right (see earlier discussed polling) creating a self-reinforcing spiral of false perceptions. Research indicates that Republicans who privately support solutions to climate change refrain from publicly doing so out of an exaggerated fear of retaliation from their peers, a fear that has been magnified by some scholars efforts to socially stigmatize the supposedly mass number of deniers among their ranks. Bill McKibben, for example, argued in a 2015 op-ed at The New York Times that anyone who did not vigorously oppose the Keystone XL oil pipeline were in fact climate deniers of a “status quo sort,” denying the “true meaning” of climate science, which according to McKibben necessitated blocking all new fossil fuel development. McKibben, Oreskes, and others asserting the viability of a 100% renewables future often cite as evidence a 2015 study led by Stanford University’s Mark Jacobson. His research purported to show that it would be possible by 2050 to power the U.S. economy by relying exclusively on current renewable energy technologies. Jacobson’s predictions, however, went well beyond even the most optimistic prior projections which concluded that a more diverse portfolio of low carbon energy technologies would be needed. A subsequently published review of Jacobson’s study by 21 co-authors concluded that his analysis involved “errors, inappropriate methods, and implausible assumptions,” over promising on the benefits of renewables in a manner that was counterproductive to policy efforts. Even though Jacobson was able to publish an immediate rebuttal, he followed by filing a $10 million defamation lawsuit against the lead author of the critique and the publisher. Facing pressure from scientific peers, Jacobson eventually withdrew his legal claim, but the damage had been done. The resulting chilling effect has likely further discouraged dissenting experts and journalists from publicly questioning 100% renewable energy claims. In each of the above cases, the emphasis has been on delivering a single narrative, and punishing those who dissent from that narrative. Such attacks are not so much about the specifics of climate science or policy, but instead about controlling who has the authority to speak on the subject. This political bullying creates strong disincentives for a broad range of experts and advocates to publicly express their viewpoints, leaving debate to be dominated by voices who all share a common problem framing and solution set. Ultimately, in the debate over what to do about climate change, conclude communication researchers Candice Howarth and Amelia Sharman, the war of labels cultivates a discourse culture where protecting one’s own identity, group, and preferred political narrative takes priority over constructive consideration of knowledge and evidence. If this dysfunctional culture continues, it will have disastrous consequences for our ability to plot paths forward to a zero-carbon economy. Numerous social science studies demonstrate that in situations where consensus is closely guarded and defended to the exclusion of dissenting voices, individuals and groups tend to make poorer decisions and think less productively. In contrast, exposure to dissent, even when such arguments may prove to be wrong, tends to broaden thinking, leading individuals to think in more open ways, in multiple directions, and in consideration of a greater diversity of options, recognizing flaws and weaknesses in positions. Several years ago, as a communication scholar studying climate politics, I made the decision to personally seek out pragmatic and problem-solving intellectuals on the Left and the Right, working in the private and the non-profit sectors, discussing with them new ideas for achieving a zero-carbon economy fueled by cheap, abundant clean energy. I have skin in this game. We all should. When my five-year old son is my age, if the IPCC’s predictions prove accurate, no matter what we do in coming decades, he and his children will be living in a world dramatically transformed. That’s why I feel so compelled to speak out about misguided choices and flawed assumptions in scholarship, advocacy, and philanthropy, and to re-imagine what is possible. I hope other academics and intellectuals will join my efforts. As Editor-in-Chief of the journal Environmental Communication, I invite evidence-driven studies, review papers, and commentaries that elevate critical discussion and analysis of the themes I have mapped out in this lecture, and that help identify new paths forward. There is no ending or solving climate change, but we can do better, rather than worse at managing the far reaching risks. Thank you. As always, I welcome your comments, feedback, and critiques. Nisbet, Matthew C. Sciences, Publics, Politics: Climate Philanthropy and the Four Billion (Dollars, That Is). Issues in Science and Technology 35, no. 2 (Winter 2019): 34–36. Nisbet, Matthew C. Strategic philanthropy in the post‐Cap‐and‐Trade years: Reviewing US climate and energy foundation funding. Wiley Interdisciplinary Reviews: Climate Change 9, no. 4 (2018): e524.